Ms. Prosy Nabwami is the current group secretary and a master artisan in the Balikyewunya Women’s Group and the district at large. She is an active mobiliser and trainer with a passion of seeing her fellow artisans develop and improve their standards of living. She also runs the group’s store/showroom in one room on her house. Recently, Ms. Prosy Nabwami was one of the first recipients of our “Light Up Their Lives!” project to provide solar kits to our cooperative members in Uganda. We have put much thought into our process and will be distributing kits based on how many children they household has, followed by their level of participation in our cooperatives. Thus, based on her long-term and important level of participation as a master weaver, trainer and group secretary; coupled with the number of children in her household; Ms. Nabwami was among the first on the list. “We are very pleased to receive the solar kit; this is a catalyst in our development” said Prosy. 1. What is the greatest advantage you will see from having this solar kit? – Better light for everyone in my house to do their work by at least 2-3 hours in the night. During this time, our children and grandchildren will be reading their books. – For me, I will be able to add some working hours to my craft work/ especially weaving. – Apart from my immediate family, 6 members of the group in the neighborhood work from my home for some hours in the evening, they charge their phone during the day. – For my children and grandchildren, they will be able to do read their books/do their school homework in better light. -I also used to pay UGX 500 (about $0.20 US) each time I took my phone for charging and have to charge it 3 times a week; I now save this money. 2. How many people will benefit from using the solar kit? – Six (6)members of the group who are close to my house will be able to meet at my house in the evening from 7-9pm as we work on our products. – During the day we are able to charge our telephones at my house instead of walking a distance and paying charging fees. 3. What will you now be able to do that you couldn’t do before owning the kit? – It was not possible to weave/ make crafts after sun set. With light of the solar kit our working time is extended. 4. How much time, energy or resources will you save because you now have a kit? – I have been walking at a distance of ½ Km to take my phone for charging and I pay UGX. 500 ($0.20 US) per charging; It stays there for almost one full day then I collect it. In total I have walked two km and unable to receive calls when charging. With an old phone like mine, I have to charge it twice a week. 5. If you have children, how will owning the solar kit specifically make their lives easier or better? – Reading light is far better and each individual is reached in the house. Children no longer have to gather around one kerosene lamp to read their books. – Because of better light, they will now read their books a little longer without headaches or worries that the fuel is soon running out. – Solar lighting is brighter than kerosene lamps. I couldn’t afford to buy several lanterns so children have to congregate around one lamp and read their book. They complain about headaches and pain in the eyes from time to time. I think over exposure to the kerosene lamps could be one of the causes. 6. What one thing do you want people who are considering making a donation to know? – The Solar lamp is a key catalyst in development of our grassroots communities. The benefit of enabling us work longer, in better light is unmatchable. -The initial cost of a Solar Kit is high for most people but again using kerosene lamps for light is expensive in the long term for example I use Uganda shilling 1,000 (about $0.35 US) for kerosene per night (6:30pm till 10:00pm). – Most of us cannot afford to buy solar because the initial cost is high. We end-up using kerosene lamps but these too are expensive in the long run. I spend Uganda Shilling 1,000 per day on kerosene for one lamp, (approximately US$ 0.35). If you want to help in an even bigger way, buy a product that is made by women like Ms Prosy over at our website. 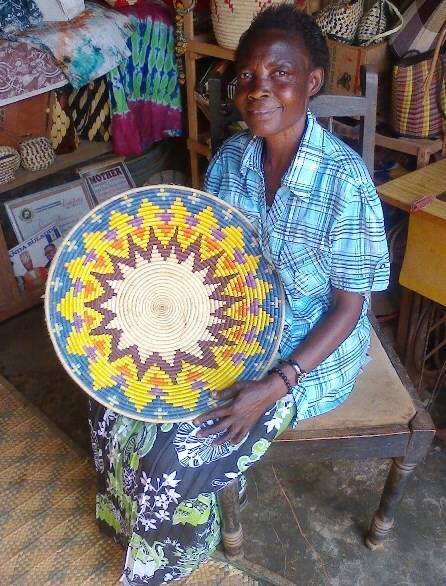 This is an amazing way to help us sell the baskets being woven by the very women in Uganda that you are proving light to. You’ll be giving twice! For every Ugandan basket ordered in 2015, Mama pledges we will donate a part of the proceeds to our Light Up Their Futures! campaign. I am so incredibly proud to have a guest at Mama’s Round Table that I can honestly tell you I love dearly, my daughter, Alexis La Pollo. Only 18 years old, she is a self-published author, president of her graduating class and someone you will certainly be hearing more about in the years to come. As a member of the first generation of African from our family born in the United States, it seemed fitting that she be the guest at my table this 4th of July. I am her mother, so of course, there are lots of other things I could ask her about which are fun and interesting. But, this is Mama Afrika’s table; so don’t worry, we will stay on topic. Hello Alexis and welcome to the Round Table. I know that you have read other interviews conducted at this table and I’d like to begin by welcoming you to this space which is so important to the future of Africa: A place where all viewpoints are welcome and respectful dialog is encouraged. 1. Who are you? Can you describe yourself in a couple of phrases? I am a daughter, sister, friend, and leader. I am African, Italian, French and American, all at the same time. 2. What does it mean to you to be African? It means the world to me to be African, even though I may not look African in appearance it is a big part of me. Growing up I met plenty of Africans both in the US and in Europe and the bond that Africans share, whether you are from Senegal or Madagascar or whether you now live in Sweden or China is undeniable. Africans have built a strong community and a bond worldwide and I am privileged to be a part of that. 3. What does it mean to you to be American? America, to me, is one of the greatest countries in the world. It is a beacon of freedom and hope to many around the world for good reason, it is a nation built on hard work, equality and diversity unmatched throughout the world. I feel proud when I tell people I am American, our nation may have made mistakes in the past, but we have overcome them and set a wonderful example for the rest of the world. I am proud to live in this land of opportunity. 4. Do you think that members of the African Diaspora, especially those born abroad, have a greater allegiance to their nation of birth or the nation of their ancestors’ roots? In many ways I feel that it greatly depends on how close the person has remained to their roots; however, I also know that no matter how detached a person becomes from Africa while living abroad they still consider Africa their home. In this way, there will always be an allegiance to Africa that runs a little deeper than the newer bond they have with their adoptive country. 5. How do you imagine your life if you’d have been born in Eritrea instead of the U.S.? I can truthfully say that my life would not be as great as it is not. Living in Europe and the US has given me the freedom to follow my dreams and forge my own path in the world. Living under an oppressive dictatorship in Eritrea would not have allowed me to voice my opinions, continue with my education the way I wanted to or even to be able to write my book. On top of this, living in Eritrea would mean being in fear of my government instead of being able to vote and give my opinions like I can here. Just being able to take part in the political process is not something I could have done in Eritrea. 6. What are some of the things that you think any young African can do to contribute to the betterment of Africa without necessarily dedicating their life to politics or running a non-profit organization? One of my favorite quotes, by Margaret Mead, reads “Never doubt that a small group of thoughtful, committed citizens can change the world. Indeed, it is the only thing that ever has.” As cliché as it sounds, small thoughtful acts done by everyone could really change everything. Donating your time, talents, or funds to an organization that you can see doing good in the world is a great start. Even spreading the world to your friends about the issues facing Africa today is a great help. The more people know about an issue, the easier it is to be solved. We cannot count on the media to spread the word for us, we must do it ourselves; and in this age of media and social networking it isn’t even difficult. Share a link, like a page, re-tweet something powerful, it is as simple as that. You may never know who will see it and be able to also contribute their time, talents or funds. 7. In what ways do you feel your African heritage has driven your goals for your own future? I think that the main driving force in my choosing to major in International Relations has been my background. Being African in particular has made me really want to make a change in Africa through the political arena. I want to see the day that all countries, especially Eritrea, see the freedoms that I had the privilege in growing up with in America and I now plan on working towards that every day. 8. If I say “tiger mom” many think of high pressure Asian mothers which push their children to attain success in all things academic. If I say to you “lion mom” what do you think of? Immediately I think of African mothers, though Asian mothers get a lot of the attention, African mothers are just as fierce. I grew up, as I’m sure most members of the diaspora have, hearing all about family that still lived in Africa. Every time I brought home a bad grade or misbehaved in some way I heard all about this cousin or that aunt who would kill to have the opportunities that I do in the west, and how it was wrong and disrespectful to them for me to squander those opportunities. I have not met many Africans, especially in my family, who have not risen up to every challenge and met every goal they set for themselves; not just for themselves but for those back home who never could. I would stage fair and just elections for all oppressed countries so that the voices of the people, the ones who really know best for the country, can finally be heard. 10. Finally, please tell us all about your book and what made you write it. 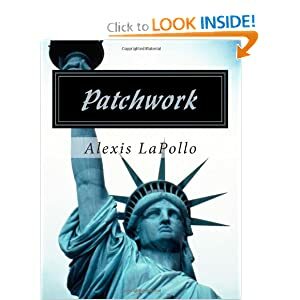 My book, Patchwork, began as a school project in my senior year and grew into something bigger than I ever thought it would be. I, and many others, struggled with my identity as a child. Where was I really from if I had so many cultures as part of me? I was filled with questions, what really makes a person American in a nation comprised of immigrants? How strongly to others feel connected to their home countries? So I set out to interview immigrants to the US from all over the world. My journey, along with their interviews are what became the foundation for my book Patchwork. Thank you Alexis for showing us a glimpse into that shadowy space where cultures blend. I often talk about how important our youth are and how necessary it is to invest in them if we want to see a strong Africa. I hope that today as many Americans of African heritage celebrate freedom and liberty in this nation; we are able to take a moment to think about how to create a generation of African youth who have the ability to express themselves and their vision for their respective countries in a productive way. Our children, be they in Berlin or Boston, Beijing or Bamako… all have something to contribute to the future of Africa. Let us raise those living in the Diaspora to take what is good from where they live and find a way to incorporate it into Africa’s future in a way that respects our indigenous traditions and heritage. Happy 235th Birthday America! And thanks most of all for giving me a safe place to raise and educate my children and for having provided me with opportunities that I’ve been blessed with during my time here. The U.S. has welcomed me and despite the glitches and needed improvements I see in this nation; I must say that today, along with millions of other people of African heritage, I am also proudly American. Click here if you missed the first part of Mama’s interview with President Kagame. 6. “No man is an island.” What women in your life most shaped your world view and influenced you? I have been influenced mostly by the injustice that I lived in my childhood and youth. There are women who worked hard in difficult circumstances – like the mothers in refugee camps who raised families in desperate conditions, and our female comrades fought beside us to liberate Rwanda. Their acts of courage and bravery are a continuing inspiration. I greatly admire the women of Rwanda and how they have taken up the task of building a new country after total devastation – they are a big part of why Rwanda is where it is today. I also have a wonderful partner in my wife Jeannette, who works tirelessly through the Imbuto Foundation to educate and empower women and girls. 7. I would imagine that one of the biggest challenges to leading a nation which has seen the devastating effects of hate speech; is to then find a balance between freedom and restraint. Considering Rwanda’s history, how have you walked the delicate line between respecting human rights such as freedom of speech and preventing hateful speech from again dividing your nation? I think the answer has been in writing a comprehensive constitution. We looked at many constitutions and also involved citizens in determining what would serve them best, considering the experience they had just gone through and how they lived harmoniously together before colonial dislocation. Today we make sure that that constitution is strictly adhered to. Only those who do not understand today’s Rwanda and Rwandans, or those feel they have a right to influence how Rwanda should be governed, talk about lack of freedom of speech. 8. I’ve noticed a certain duality in your leadership style. On the one hand, you have reached back to Rwanda’s traditions to implement solutions such as the Gacaca courts; yet you are also utilizing high-tech solutions like Twitter to communicate. How do you think Africa in general, and Rwanda in particular, can best manage the natural conflict sometimes caused when tradition and new ideas meet? I seek out the best of everything, in tradition and in modernity. I am relatively new to tweeting but I really like the way it allows me to talk directly to people all around the world about everything from African politics to Arsenal, my favourite football team. Similarly, the traditional Gacaca court system helped us try a huge number of genocide cases quickly but, more importantly, it also helped reconcile and unite Rwandans after an incredibly painful period in our history. 9. “Africa for Africans” is a phrase that is used by some to mean that Africa shouldn’t be “recolonized” by China. For others, it means that Westerners shouldn’t be the ones that dictate the solutions to Africa’s problems. Others use it to mean we should look invest in our African children in the hope that they will be our future problem solvers. What does the phrase mean to you, Mr. President? It means Africans determining their own destiny. We truly value the support and friendship with partner countries, including China and other countries in the West and elsewhere but ultimately, Africans alone must shape the future of this continent. By giving our children the best possible education and health facilities we are not only giving them the best start in life – but ensuring Africa’s continued dignity, development and transformation. This is the only way for us to be on equal footing with the rest of the world. 10. Please forgive me for asking such an unsophisticated question to a man of your status. But, it has become a tradition here at Mama’s Round Table, and if you’ll allow it; I’d like to ask you the same question that I ask all of my guests: If you could wave a magic wand over Rwanda and change one thing; what would it be? I would rid Rwanda of all poverty so that everyone, regardless of background or birth, were able to enjoy all the opportunities that this wonderful country, and our abundant continent hold. Again, thank you so much Mr. President for your time and candor. I am sure that no matter where people stand on the issues that we’ve discussed, they would join me in thanking you for sharing your time, views and opinions with us. As for me, I look forward to another 10 years of work with the wonderful people of Rwanda. May God bless your beautiful nation with a wonderful and prosperous future. Feel free to share your views with us in the comments section below. This is a round table after all and all voices are welcome! After a great year of dialog with some fascinating guests like Freweini Ghebresadick, Tendai Joe, Josef Scarantino and Nigel Mugamu; I am really looking forward to a great year ahead at Mama’s Round Table! I have a dream list of some captivating and influential people that I am hoping will accept my invitation to meet with us here. Wish me luck! A big thank you to last year’s guests! They are much appreciated and I think we’d agree that they’ve opened our eyes to some interesting issues including tech, aid, human rights and the role of the Diaspora in rebuilding Africa. Thanks to your input, through comments on the blog, we’ve been able to have civilized, respectful dialog on a host of issues and I hope that you’ll stay with me (and maybe even invite a friend or two to join you) as we continue down the path of dialog. I want Mama Afrika’s World to be a world like no other: a world where you and I can feel safe to talk about ALL things facing Africa and Africans. In a world where things have gotten more and more politically correct (my two least favorite letters are now P and C because of it! )… Welcome to a safe space to come and dialog: Mama Afrika’s Round Table. This year, I’ll invite people to come and sit with me to talk. I will be inviting “experts” from time to time; but all in all, I want this to be a place of equals: you and me. Dialog is what has been lost in recent times. We communicate with less than 140 characters on Twitter, the political scene is more and more divisive regardless of what country you live in, name-calling and accusations have become substitutes for honest disagreement or fair and open discussion. To this, I say “STOP!” Let’s take the time to listen, form our own opinions and share them politely and with respect. If you are interested in the usual “anyone who disagrees with me is an idiot!” kind of thing… there are thousands of blogs, organizations and places you should be instead. Leave now… and take your attitude with you. It simply isn’t welcome in Mama’s house, or at my table. If you would like to discuss anything here or if you have a guest that you’d like Mama to invite to the Round Table; please leave a comment here or contact Mama on Twitter or via email. Either way works just fine. I’m open to any subject, whether it is my specialty or not. I love to learn; not just teach. OK, grab your favorite cup of African fair trade coffee, some Red Bush tea, or maybe a glass of red wine… and let’s start talking! ** ALL interviews conducted at Mama’s Round Table are posted unedited. I NEVER alter answers given to my interview questions. To do so would violate the principle that dialog at this table remains open and honest. Occasionally, slight grammatical errors may be corrected; but only with the interviewee’s permission.